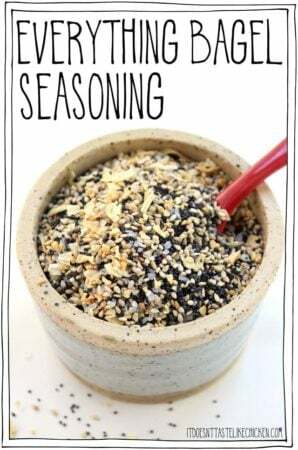 Last week I made a recipe for Everything Bagel Seasoning, and let me tell you, I have been sprinkling that gloriousness on just about every food I have been eating. Hummus, avocado toast, salad, popcorn… the amount of yum is endless. But then genius happened when I generously sprinkled this seasoning over some cauliflower steaks and roasted them up. The cauliflower steaks were tender, juicy, a little crisp around the edges, and the everything seasoning sang wonders when toasted in the oven. 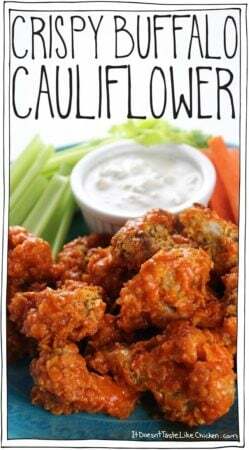 I could NOT stop eating these everything bagel cauliflower steaks! No really, it was a bit of a problem. I really couldn’t restrain myself, not even while doing the food photography. The smaller florets were entirely devoured by the time I was done my photography session. I just kept zooming in so that no one would be able to see the missing pieces. Whoops! 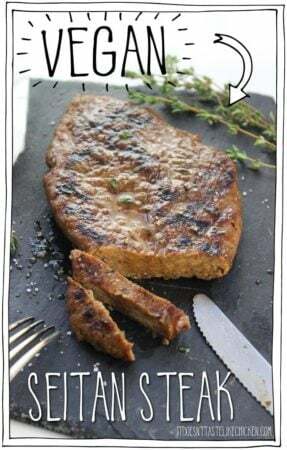 To make Everything Bagel Cauliflower Steaks: start by cutting a head of cauliflower into 1-inch steaks. I find the easiest way to do this is to leave all of the greens and stem on the cauliflower which will help it hold together when slicing. You can then trim off any greens once cut into steaks. You should get about 4 -6 steaks depending on the size of your cauliflower. 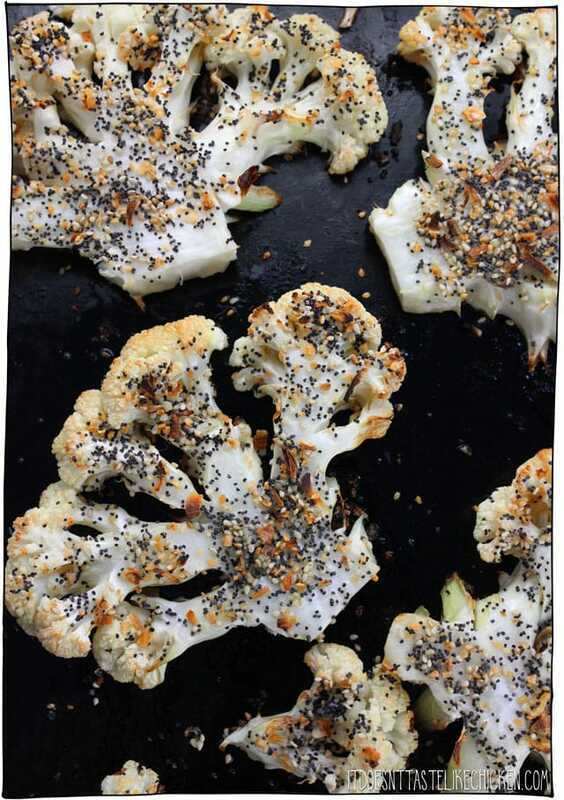 Lay the cauliflower steaks along with any leftover florets on the baking sheet. 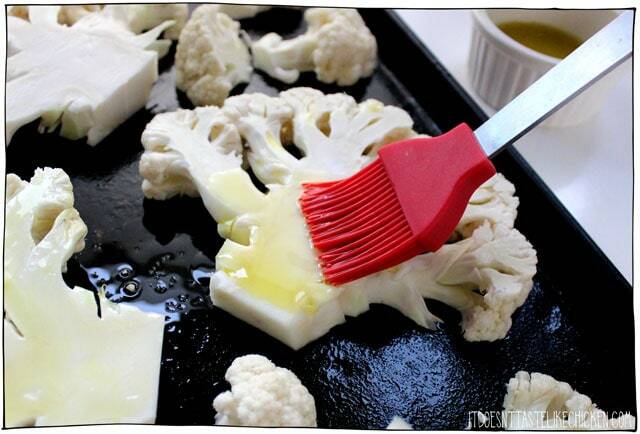 Liberally brush each cauliflower steak with olive oil or non-dairy milk of choice. The olive oil will result in a slightly richer and more golden cauliflower steak, but non-dairy milk is a great option for oil-free or anyone watching their calorie intake. 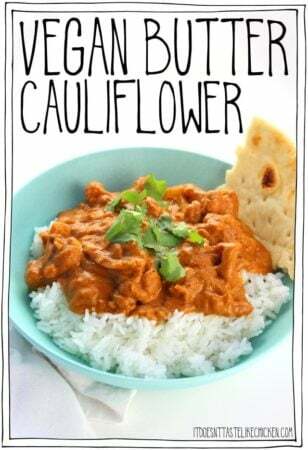 I experimented with using coconut milk which added a lovely additional layer of flavour. Both methods cook up beautifully. 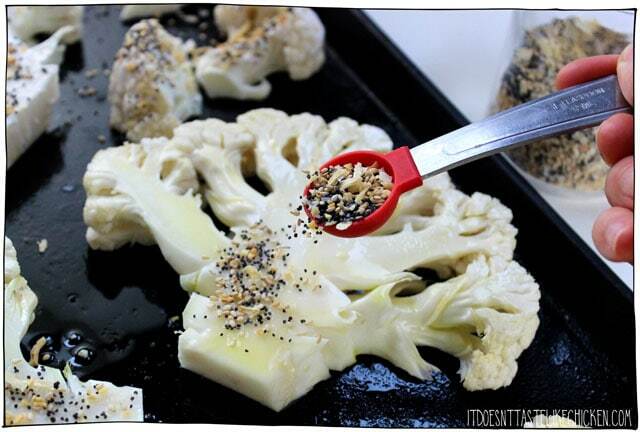 Once the cauliflower is coated, sprinkle about 1 1/2 teaspoons of Everything Bagel Seasoning onto each steak. 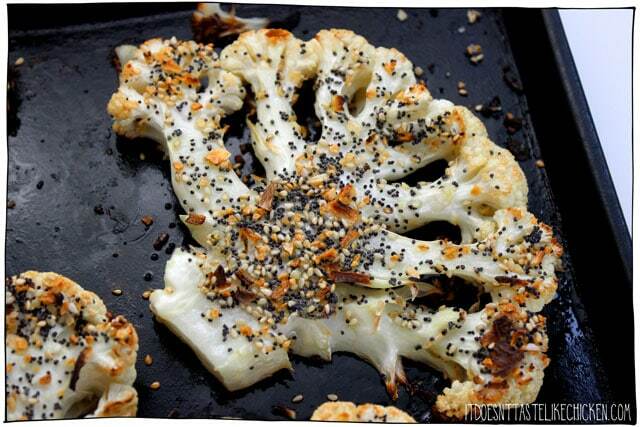 Bake for 18 – 25 minutes until the cauliflower is golden on the edges and tender all the way through. Serve hot with desired sides. Tender, juicy, a little crisp around the edges, and the everything seasoning is toasted in the oven making this cauliflower irresistible! I could NOT stop eating these! 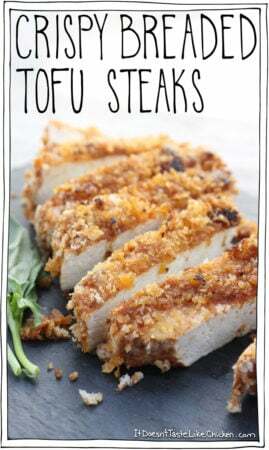 To slice your cauliflower: slice the cauliflower into 1-inch steaks. I find the easiest way to do this is to leave all of the greens and stem on the cauliflower which will help it hold together when slicing. You can then trim off any greens once cut into steaks. You should get about 4 - 6 steaks depending on the size of your cauliflower. Lay the cauliflower steaks along with any leftover florets on the baking sheet. 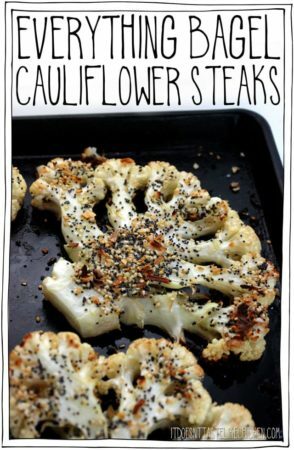 Liberally brush each cauliflower steak with olive oil or non-dairy milk of choice. Then sprinkle about 1 1/2 teaspoons of Everything Bagel Seasoning onto each steak. 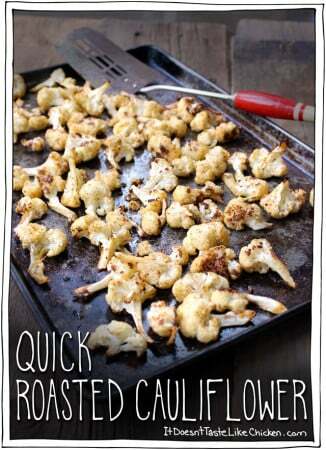 Bake for 18 - 25 minutes until the cauliflower is golden on the edges and tender all the way through. Serve hot with desired sides.